Differential gear is a part of power transmission device. The driving force generated by an engine is transmitted to the tires through various types of bevel gears. Representative of the automotive components that incorporate such bevel gears is the differential gear assembly that absorbs the rotational difference due to the direction change of the diving rotational axis or the rotational difference between the right and left wheels, produced during cornering. 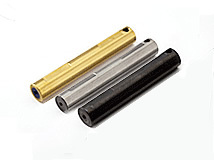 Characteristics: SHOWA has achieved weight reductions by adopting aluminum for the gear material. 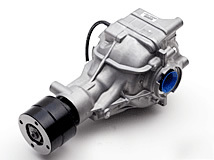 SHOWA’s products can be used commonly in both RR (rear engine, rear-wheel-drive) four-wheel-drive vehicles and FF (front engine, front-wheel-drive) base four-wheel drive vehicles. Vehicle models: Used for the final decelerator and changing angle for all four-wheel drive vehicles. Characteristics: Converts rotation axis by 90°, and also offsets the torsion position relationship of the two gear axles. 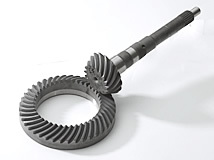 SHOWA’s gears offer excellent gear strength and quiet operation. This gear set offers high strength and excellent quietness. Characteristics: Responds to a wide range of needs through changes in the surface handling method corresponding to loads.